Greener Journeys has won a prestigious award recognising its achievements on behalf of the bus sector, across a string of highly successful campaigns. The Gold Award for Sustained Marketing Excellence from the UK Bus Awards follows several years of tireless campaigning by Greener Journeys to highlight the value of the bus to our society, economy and environment. Judges said they had noted the “substantial achievements of Greener Journeys on behalf of the whole bus industry” including its campaigns for the national Bus Pass scheme, the Bus Service Operators’ Grant, and investment in bus infrastructure. Now in its 21st year, the UK Bus Awards celebrates examples of best practice which highlight the industry’s finest achievements and can be used to inspire managers and staff across the country. Norman Baker, former transport minister and Chair of Bus Users UK, presented the gold awards to winners selected from over 270 entries, at an event ceremony on November 23, hosted by BBC broadcaster Jane Hill. Greener Journeys, the cross-sector campaign group dedicated to encouraging modal shift from car to bus, has run a series of hard-hitting carefully tailored campaigns over recent years, using robust evidence to demonstrate the economic, social and environmental benefits of bus travel. Catch the Bus Week, an annual campaign bringing together operators, local authorities and bus supporters to celebrate the benefits of bus travel. 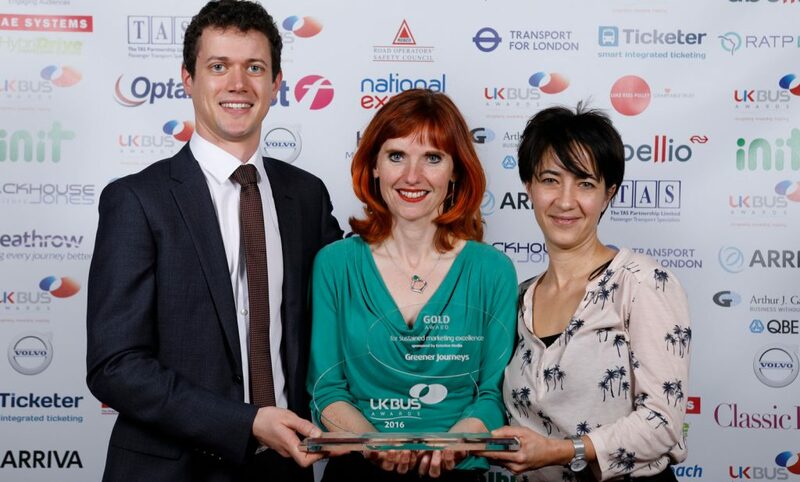 “Greener Journeys campaigns tirelessly and wholeheartedly in support of the bus, and we are delighted that our sustained success has been recognised by the UK Bus Award judges. Greener Journeys is a campaign dedicated to encouraging people to make more sustainable travel choices. It is a coalition of the UK’s leading public transport organizations, user groups and supporters. It aims to reduce CO2 emissions from transport by encouraging people to switch some of their car journeys to bus or coach instead. Switching from car to bus for just one journey a month would mean one billion fewer car journeys on our roads and would save 2 million tonnes of CO2 every year. For more information visit www.greenerjourneys.com.